It's a boy! Now I can start baby knitting! I love these mitts; they're so squishy! I'll have enough fleece left over to make myself a pair too! What a nice clear ultrasound! Congratulations on your little boy! 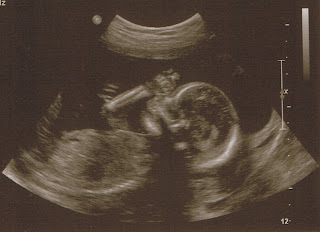 I can't believe how clear ultrasound pictures are these days! Thanks for sharing! Congrats! Guess I should have understood when you mentioned a Jedi, but I didn't get it. Oh, look. . .he has knitting needles in there!